19 Signs That Scream ‘Emergency Care Now!’? How do you build a first aid kit for your pet? SEIZURES: CANINE ACUPRESSURE + ICE! With Labor Day in the USA coming up in a few days, we thought we would give you some help if you’re taking your puppy or adult dog on the road with you. Puppies commonly suffer from motion sickness, but older dogs can have their moments too. It can turn road trip into an unpleasant and miserable ordeal for all concerned, not to mention being a dangerous distraction for the driver. Those of us who have had the experience of a carsick dog might apply any number of descriptive and colourful phrases to the situation. In Traditional Chinese Medicine, regurgitation is considered ‘rebellious stomach chi.’ Stomach chi supports the stomach’s ability to function properly and Stomach chi is supposed to flow downwards, not upwards. If it goes in the wrong direction and the dog vomits, it’s being ‘rebellious’ and is not a lot of fun for the dog, driver, or anyone else in the car for that matter! 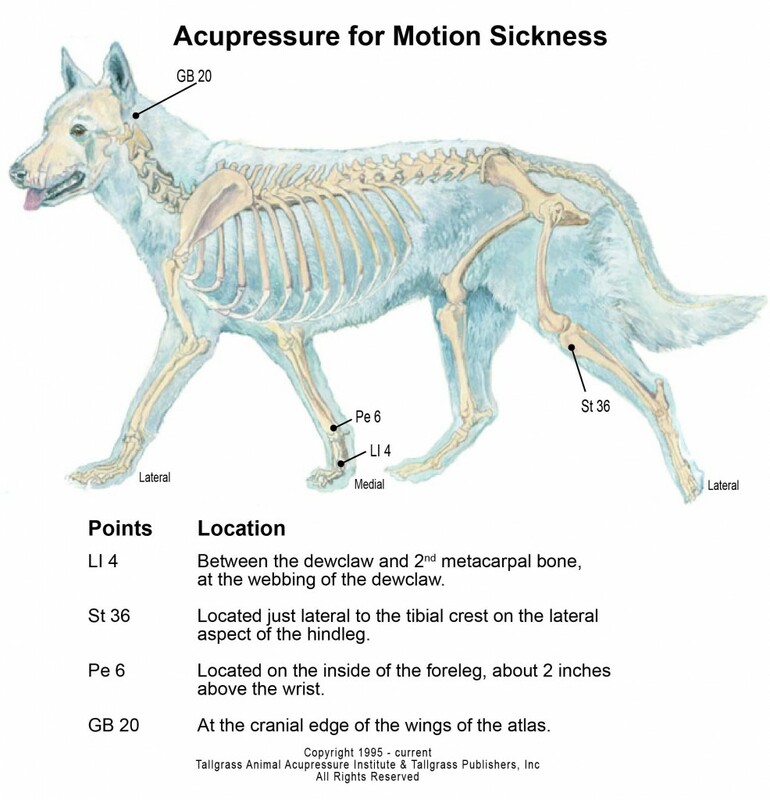 Acupressure – applying pressure to certain specific points on your dog’s body – can enable you to help him balance the flow of energy through his body, so the stomach chi flows in the correct downward direction. Acupressure Motion Sickness Session You can give a motion sickness/nausea acupressure session whenever you suspect that traveling with your dog might be a bit of a rocky ride for him. It’s best to offer this session about an hour before actually getting in the car. Remember to hold the acupoints shown in the chart on both the right and left sides of his body – bilaterally. 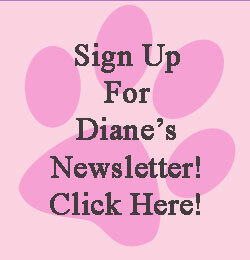 Click to Receive Monthly Newsletters! Always remember to consult with a certified professional before attempting to practice any form of medicine. The techniques presented are designed to enhance the healing process and are not intended to replace conventional medical or veterinary healthcare. I do not provide medical diagnosis, prescribe medications or perform surgery. Seek licensed veterinary care when indicated.